Something strange is afoot in Alfheim Online - a rumour of a duelist stronger than any other is spreading, and it’s up to Asuna to take her on in this manga adaption of Sword Art Online’s Mother’s Rosary story. Weeks after Kirito and Sinon’s final battle in Gun Gale Online, life has gone back to normal for Asuna now that she has her lover back in Alfheim Online with her. Wanting to hold onto these peaceful days forever, Asuna and her friends spend as much time together in the virtual world adventuring as possible. However, Asuna starts to feel discontent with her mother’s disapproving expectations weighing heavily upon her. Looking for a distraction, she hears from her friends that a solitary duelist has been challenging and defeating the strongest fighters in Alfheim Online, including Kirito. With her curiosity piqued, Asuna ventures to take on the “Absolute Sword”. If you’re a fan of the Sword Art Online franchise looking for another retelling of the Mother’s Rosary story-arc, or looking for a different sort of action-series, you’ll be interested in this series. Like many of the Sword Art Online story-arcs, Mother’s Rosary has a multitude of different adaptions which tell the story with varying levels of skill. This adaption of Asuna’s major story picks up immediately after the conclusion of the Phantom Bullet arc, skipping any sort of introduction while more or less assuming readers are completely up to speed on Sword Art Online story, so those new to the series should steer clear until they’ve read the preceding story arcs. The story doesn’t exactly get off to a compelling start, with most of the first chapter devoted to following Asuna and friends as they sit around and discuss the latest rumours about a powerful new duelist. While this got across all of the necessary narrative information and set the stage for the story, this chapter certainly didn’t win any style points and was a bit of a boring start to the volume. Things get underway more readily starting from the second chapters as Asuna jumps back into the real-world before venturing out to fight the Absolute Sword. We see a fairly uncomfortable dinner “conversation” (reminiscent of a business transaction more than anything) between Asuna and her mother that does a decent job contextualizing her discontent she feels due the immense pressure she faces at home. It’s not groundbreaking stuff by any means since we don’t have a lot of prior understanding of Asuna’s backstory in the broader series, and it felt like this scene would have had a little more impact had it happened later in the story to provide a little more of a foundation for Asuna’s feelings. While it isn’t clear yet how this will play into the overarching story, I’m hoping that it will give her character some depth as this arc proceeds, and I thought that this was generally an interesting development to introduce into the story. The second half of the volume follows Asuna as she seeks out and duels the Absolute Sword. It was funny to see Asuna’s surprise at the Absolute Sword - also known as Yuuki - turning out to be a girl, and this leads into a breezy fight scene which takes up the rest of the rest of the volume. We get to see an enjoyably acrobat fighting display as the two dual, and one of the things I really enjoyed about this fight was the way that Asuna’s thought process was narrated to us. This was helpful in clarifying what was going on, and I thought that these snippets of her thoughts actually did a pretty good job of conveying her character through her reactions to various moments of the fight. I thought that this scene did a good job portraying her process of having fun and losing herself in the virtual dual, and this picked up nicely on her frustration expressed earlier in the volume at how she feels more at home in the game compared to real life. The helped to provide a very tangible example of the emotional stakes at play earlier on, adding another layer to this fight scene. The art in this volume is a thoroughly mixed bag, and I can’t really say that I was particularly impressed by much of it. I felt that the scenes featuring some of the more dramatic close-up shots were generally the best drawn in this volume because mangaka Tsubasa Haduki was able to effectively use the characters’ facial expressions to portray their feelings. However, the character designs come off as a little bit jagged at times, and the faces felt inconsistently drawn, coming off as pudgier and wider at some moments, and then narrower and more angular at others. The art during the fight scenes wasn’t especially impressive either, and I found a number of panels uncomfortably cluttered in a way that made it difficult to see what was going on. The sheer amount of SFX used was also quite obtrusive in many cases, and there were a number of panels which were dominated by an abundance of SFX markers which did not help with the clarity of the sequences at all. Sword Art Online: Mother’s Rosary Vol. 1 is a decent start to this story arc in laying out Asuna’s emotional stakes as she considers her priorities between the real-world and her life in the virtual world effectively . This was brought out in the context of her duel with Yuuki, and this made for an interesting basis for the story to build upon. However, this adaption suffers from weak art on the whole, and this particularly becomes a problem in making the action sequence more cluttered and difficult to follow than it need be. 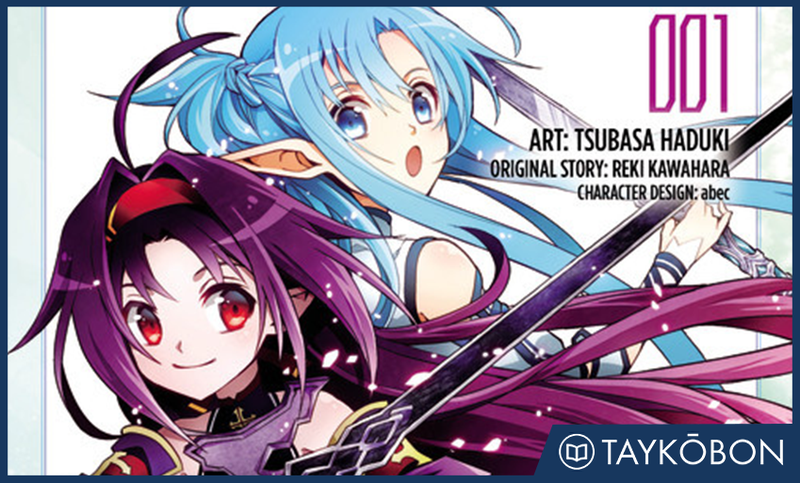 Fans of Sword Art Online who are ready to buckle in for another continuation of the story won’t likely be dissuaded by this volume, but those who are less committed should probably proceed with some caution with this adaption. Sword Art Online: Mother’s Rosary Vol. 1 was published by Yen Press on March 22nd, 2016 and translated by Stephen Paul. Authored by Koutarou Yamada and based on the original story created by Reki Kawahara, the series is currently ongoing in Kadokawa’s Dengeki Bunko Magazine. Volume 2 is scheduled to be released in English on June 21st, 2016.